What can I send to Greece? What items are restricted? Due to varying delivery times to islands we do not recommend sending baggage for a 1-2 week holiday on this route. Allow 1-5 extra working days for delivery to islands. The baggage you take on holiday has become a big issue over the past few years, especially when using budget airlines, which will charge extortionate fees for baggage that exceeds their limits. Send My Bag can help by collecting your baggage at home and delivering it to your destination for a low price. Families, groups and sports teams can all take advantage of our safe and secure delivery service, meaning that they can travel with the minimum of hassle. Our service is also great for students who are relocating for their studies and want to take their stuff with them, or for those who just don’t want the hassle of carting their heavy luggage around the airport or onto public transport. Sending your luggage and boxes to Greece with Send My Bag is an excellent option if you are going on holiday to Greece and you need to bring lots of clothing or sporting equipment with you. It’s also a great solution for students relocating to Greece who need to bring enough of their possessions with them to set up home in Greece for a term, or longer. Sending your luggage to Greece with Send My Bag means you can bring many more of your favourite things with you than you could on the plane. To find out more about sending luggage to Greece, visit our ‘How it works’ page, or our ‘FAQs’. Although Greece doesn’t have a large number of golf courses, the ones it does have are well worth a visit. Try the new courses at Costa Navarino or the Olive Grove course at Porto Carras. If you want to try out some of these courses, you can do so using your own clubs by sending them to Greece with Send My Bag. This way, you can also avoid oversized baggage fees from your airline. Read more about how to send golf clubs with Send My Bag, including how best to package your golf clubs. Greece is a great location for a cycling holiday. You can enjoy your break all the more by using your own bike, rather than renting one. You can send your bicycle to Greece with Send My Bag. This is much easier than checking your bike into the hold of your plane. You will avoid oversized baggage fees and won't have to carry the bike to and from the airport. Your bike will need to be taken apart and properly packaged before being sent to Greece. Check out our information on bike shipping to learn more. If you are relocating to Greece to live there permanently, you will have to consider international removals to Greece to bring all of your possessions with you. Make sure you choose a reputable removal company and pack everything up well before you hand your items over to the movers. Greece is an attractive location to spend time studying, whether as part of a year abroad or for a full degree programme. Greece has a number of good universities to choose from, such as the Aristotle University of Thessaloniki, the University of Crete and the National and Kapodistrian University of Athens. If you are a student moving to Greece, you will need to bring a lot of things with you, such as your course textbooks and many other everyday items, like fiction books, clothes and DVDs, so shipping your possessions is a handy option. Read more about student shipping on our student removals page and find out how to receive your student discount. Sending a parcel to Greece with Send My Bag is very useful if you realise you have left some items at home. You can just ask a friend or family member to put the forgotten items in a box and send them on to you in Greece. Or, friends can send you care packages and gifts. Just make sure they are aware of restrictions on sending brand new items (see below). When sending a parcel to Greece, choose a sturdy box and tape it up well so nothing gets damaged in transit. Find out more about sending a parcel and learn what you can send with Send My Bag and how to package your items. To send large bulky items you could try air freight. This type of service normally takes one to two days, making it a speedy option. But, it can be quite expensive, depending on the size of your item(s). You will likely have to pay for the services of a customs agent to handle customs clearance for you, and you will need to consider how to get your items to and from the airport. The price could, therefore, quickly mount up. If you send internationally by air freight to Greece your items will likely arrive at one of the major airports, such as Athens, Heraklion or Thessaloniki. Instead of air freight, you could choose sea freight, or container shipping, to move large items like a cooker or an armchair to Greece. Since sea freight can take a number of weeks, it is a good option if you don’t need to receive your items immediately. This option can be less expensive than air freight, but you will still need to pay for the services of a customs agent and will need to arrange how to get your items to and from the ports. When using container shipping to Greece, your items will arrive at one of the major ports, such as Piraeus or Thessaloniki. If you wish to ship goods to Greece, you need to be aware of any customs duties and taxes you need to pay, due to your items being brand new and not used personal effects. Also make sure you know what items are restricted and which are entirely forbidden from being shipped to Greece. Fairly easy and simple to book with excellent delivery time! Greek customs inspect all shipments, which can take up to 10 days, this is outside of the control of Send My Bag and as such time sensitive shipments such as baggage for a holiday should not be sent on this route. A fee of c. 40 Euros may be charged by Greek customs for processing, if charged, the fee must be paid directly to Greek customs by the receiver before the shipment will be released by them for delivery. Send My Bag cannot facilitate the payment of this fee. Unlike most other countries Greek customs do not always consider temporary imports such as those for a holiday or business trip, or the import of goods by returning residents who have been outside of Greece for less than one year, as tax exempt, customs will assess shipments on a case by case basis. If Greek customs assesses that duty and taxes are due, these will need to be paid by the receiver directly to the customs authority in Greece. Shipments of personal effects require a copy of the owner’s passport and a copy of their flight ticket to be uploaded to their Send My Bag account to demonstrate to customs authorities that they have travelled, or will be travelling to Greece from the country they are shipping from. In addition, customers relocating to Greece may be required to provide proof of their registration in Greece and confirmation of their reason for stay such as a letter from their University if studying, or employer if working. Personal effects are usually assessed as used items that have been in the sender’s possession for 6 months or more. If you are sending Christmas gifts to Greece please check with Greek customs so you are aware of potential customs duties, follow any advice given and attach all necessary documentation. Customs processes and allowances do vary according to country so we advise all travellers to take 5 minutes to check how their personal circumstances and what they are sending will be assessed under prevailing Greek customs rules. 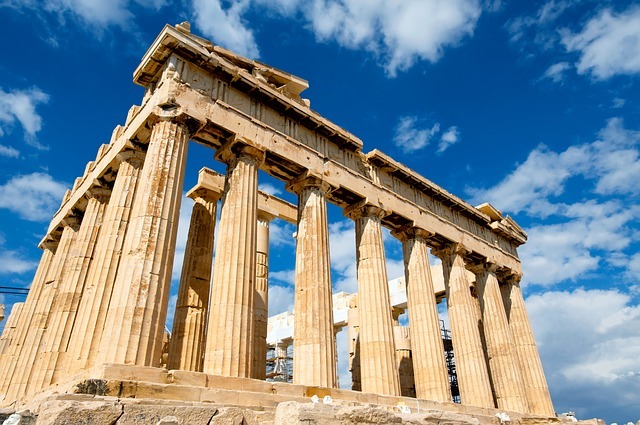 With a history dating back nearly 4000 years, Greece is home to some of the most awe-inspiring ancient ruins in the world, including Olympia, site of the Olympic Games in ancient times, the Acropolis in Athens and the monasteries of Mount Athos. Due to its location, Greece enjoys a Mediterranean climate with hot summers and mild to cool winters. The majority of locals avoid physical activities outside between 1pm and 5pm when the sun is at its strongest and it is recommended that visitors do the same. Spend the morning sightseeing before retiring to the beaches to relax in the afternoon. The main draw to Greece is the range of first-class historical landmarks spread throughout the region, reminding you of a time when Greek scholars made their mark on science and architecture. The main language spoken in Greece is Greek, but as its part of the EU, you will also hear a wealth of other languages, including English. Greece uses the Euro as its currency. Many of the smaller islands of Greece offer great photo opportunities for tourists, with their famed whitewashed coastal towns and sandy beaches. The bigger islands are great for those who want to experience a truly Greek lifestyle with water sports on most beaches and vibrant nightlife. And a must-visit for one of the best sunsets in the world is the Island of Santorini (Thira). Mainland Greece is the place to go for adventure seekers, with outdoor activities possible throughout the region, including rock climbing, archery, kayaking and hiking.